for me to stress out about what we are going to do for school next year. Unfortunately, I won't have the opportunity to visit a wonderful vendor hall to help me in making that decision, as I simply cannot allow my money to support our state homeschool organization. So, vendor websites, catalogs, word of mouth... and prayer. Oh, and begging for help from everyone who "knows" me online too. Richard (6, 1st grade) and Katrina (4, PreK) will be using Heart of Dakota's Little Hearts for His Glory, so they will also be doing world history, starting from creation. Hopefully it won't spend too much time in areas we've been doing this year, but regardless, the resources are definitely more age-appropriate and I think it will be fun. Little Hearts includes history, Bible, some great read-alouds, and science. But what do I do with William (11, 6th grade) and Thomas (9, 4th grade)? Figure out a Sonlight core that they could re-do. Maybe do my own version of a 3/4 package. That we could do without spending money, but yikes, I'm just not sure if I want to be doing modern world history, a broad sweep of world history, and US history. And I would have to be creating my own program, based on the Core 3 and Core 4 IGs, time I could better use in teaching my kids. Huh, but I think I get the upgrade discount price for a 3+4 IG, in which case... I have to look into that. Heart of Dakota just came out with Hearts for Him Through Time: Resurrection to Reformation. This would be world history too, and yet another time period. This is the answer that is tugging at me right now, but it would be the most expensive. It schedules the IEW materials, which I love. I own, or the library has, quite a few of the books used. It is mostly the cost of the book and student notebooking sets ($135), and Mystery of History 3 ($60) and What in the World Volume II ($25). Plus another $60-70 in books. I just don't think I can do this, especially when I can't see it first. (I can get some of the above for slightly less, and I don't need MOH until 15 weeks into the program.) This uses history "texts" from five different authors plus whatever the HoD folks include. What do I do? I see serious drawbacks to them all. And they all sound fun too. This is how boys use hula hoops. Must. Stay. Inside. Hoop. Isn't Richard just so cute? Thomas had no interest in archery, but BB? That was another story. Oops, I lied... hardly worth posting, but the red hat is on William. As part of the Old Schoolhouse Homeschool Crew, we've had the opportunity this past year to review all kinds of interesting things, some more applicable right now than others. So this review is about one of those not as applicable at the moment items. Cerebellum Corporation creates a number of instructional DVD series. The two I was familiar with are Standard Deviants and Light Speed. Well, the Light Speed 'brand' has come out with a new line for preparation for Advanced Placement exams. Right now, they have four titles in that series -- U.S. Government, US History, Writing and Chemistry. We received the Chemistry set to review. Now, if you aren't familiar with AP tests, these are tests taken through the College Board (that would be the folks behind the SAT and PSAT). Doing well on the test is likely to land you some college credit, or at least let you place out of intro level courses and into more interesting material. When working up a high school plan, Connor penned in a couple of AP tests. What we got: Each program (currently on sale for $11.24) consists of a DVD and a CDROM. The DVD is about an hour long, and it covers information about the test, test-taking hints and strategies, and a quick tour of the 30 most tested topics on the exam. "Light Speed" is a very appropriate name, as this part is 30 minutes long. Yeah, a topic per minute, with topics including things like thermochemistry, half cell reactions, and enthalpy. Yikes. The presenters on the video all look to be right in that high school senior age range, and they do have an engaging presentation. The CD-ROM includes a pdf document with an outline of the DVD, essentially, and I have to say that made it much easier to follow what was happening on-screen. 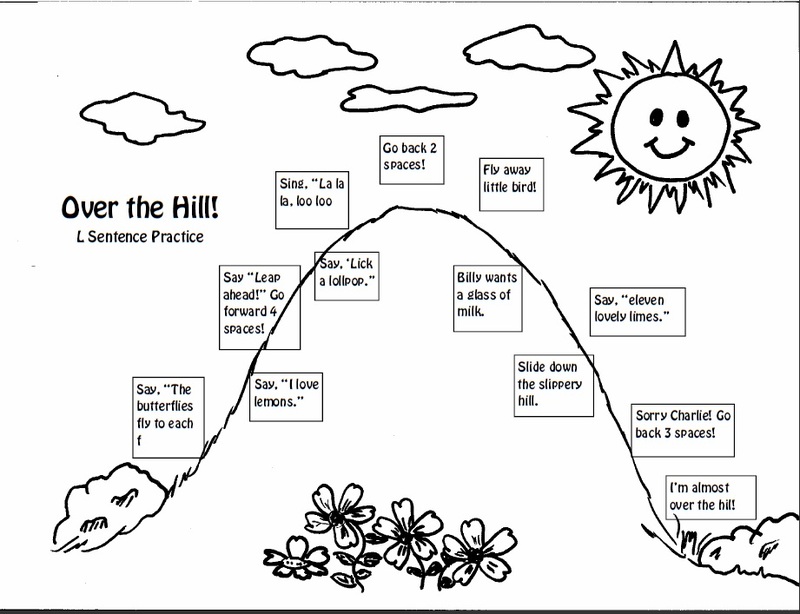 The pdf file also includes a number of worksheets, and the answers. The worksheets contain all the question types found on the AP Exam. But Connor and I watched the video together, and we both felt that this seemed like it would be a really nice addition to preparation for an AP test. We'd probably use it after completing our regular coursework, when at least some of the material should sound familiar. Then we'd do some actual AP specific preparation. Then, shortly before the exam date, we'd watch the video again, do the digital workbook, and pray for the best. Disclaimer: As part of the TOS Homeschool Review Crew, I did receive Chemistry AP Exam Prep for free from the publisher. The fact that I received a complimentary product does not guarantee a favorable review. It does guarantee a review. A fair review. But I am not going to praise something unless I think it deserves the praise. If I don't like it, you'll hear that. And hopefully with enough detail as to why so you can decide for yourself if what I hate about it makes it perfect for your family. For more about my take on reviews, visit my blog post here. My latest BookSneeze book is Will the World End in 2012 by Raymond C. Hundley. My brother has given me reading material in the past relating to some of the various 'end of the world as we know it' scenarios, so I was really interested in reading something from a Christian point of view. From the publisher: In the first millennia after the birth of Christ, nestled in the mountains of Central America, the Mayan people gazed at the stars and calculated days, months, years, and even the future. Their calendar, more sophisticated than any the world had known, indicated an abrupt end of time, December 21, 2012. The future they predicted is now upon us. “There have been 149 apocalypse predictions between AD 44 and 2009,” says author Dr. Raymond Hundley. But will it really happen? In this stirring, balanced, and well-researched book, he evaluates the ten most prominent apocalypse theories and gives a surprising answer to the question everyone is asking. His knowledge and insights lead to compelling conclusions . . . and a heartfelt call for all of humanity to look upon Jesus Christ as it seeks clarity and peace. So, I dug in, expecting to read it over a few days. Instead, while not quite in a single sitting, I did get through most of it in a day. I loved the format. Each chapter started with a story about a world-end prediction, and then the author explained what the theory was in a factual way. That was followed by more of an editorial description where he brought it other points of view and sometimes expressed his own opinions. Each chapter ended with a conclusion as to the liklihood of that particular scenario. Ten chapters cover ten arguments for why the world will end in 2012. The final two chapters wrap it up, with the final chapter being strongly from a Christian point of view. I plan to change things up and be the one passing reading material on to my brother this time. Disclaimer: As Booksneeze Blogger, I did receive this book for free from Thomas Nelson. No other compensation was received. The fact that I received a complimentary product does not guarantee a favorable review. It does guarantee a review. A fair review. But I am not going to praise something unless I think it deserves the praise. If I don't like it, you'll hear that. And hopefully with enough detail as to why so you can decide for yourself if what I hate about it makes it perfect for your family. For more about my take on reviews, visit my blog post here. Okay, I have to confess. I'm scared that nobody is going to enter my first ever blog giveaway. That has made me really hesitant to post anything. But here goes! Yoplait provided me with two free cups of their new Greek Yogurt, and a spa gift pack through MyBlogSpark. It was totally up to me as to whether or not to blog about it, but I do have the chance to offer one of you the chance to win a similar pack. 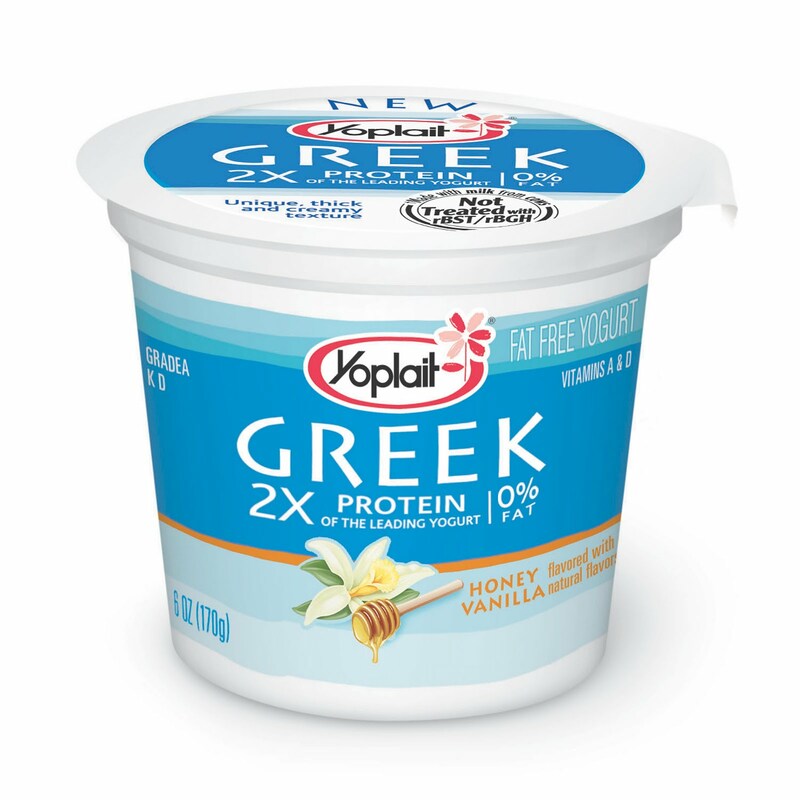 I had a hard time finding Yoplait Greek Yogurt in the store the first time I went shopping. But a few days later, every grocery store I entered had them. I chose to try Blueberry and Strawberry. Then, with the coupon from here and another from the paper, I was able to pick up a couple more for $.10-$.40 (on sale for a dollar, at a store that doubles coupons). So I got another Blueberry, and a Honey Vanilla. So what did I think? First off, I love the idea of more protein. And I love the idea of 0% fat. 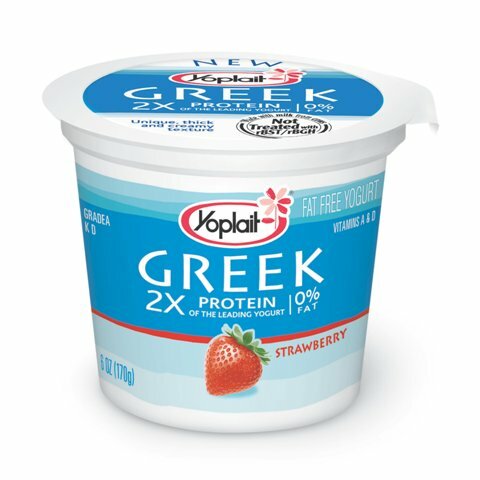 One reason I don't eat yogurt frequently is that I try to have a more balanced ration of protein to carbs... the three flavors I tried contained 12 g protein and 19 g carbs. Far better than the last Yoplait Original we had (7.2 g protein and 24.2 g carbs). But how did it taste? 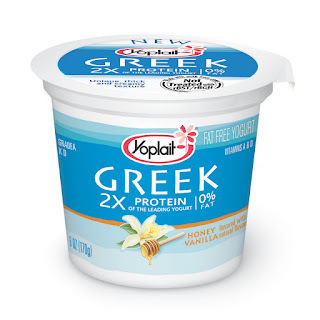 Well, it is different than that Yoplait Original. Not as sweet, more of a yogurt taste. And it has, I don't know how to describe it, it has a grainier feel to it. And thicker too. After a couple bites, I liked it. Now, this isn't something I am likely to be purchasing for breakfast every morning. But when it is on sale, especially if I have a coupon, I will certainly continue to purchase more. Blueberry was my favorite. Okay, so now the fun part for all of you! Yoplait and MyBlogSpark would like to give away a similar pack of stuff to one of my readers. To enter the giveaway, you must leave a comment on this blog post telling me which flavor you would get with your coupons. (I didn't try Plain -- otherwise, I talked about the rest!). For a bonus entry, if you follow my blog publicly, leave another comment telling me that you already were a follower, or that you just became one. Deadline for entries is Monday, May 3 at midnight Mountain Time. I will draw a winner and notify them by email (if your email is included) or on this blog on May 4. If I do not hear back from the winner within 48 hours, I will draw a new name. Disclosure: Yoplait and MyBlogSpark provided me with the yogurt coupons, the prize pack, information about the new Greek Yogurt, and the giveaway. It was up to me as to whether I wanted to post about this product, and all opinions in this post are mine. I was not given any other compensation for this post. And the free product coupon is not valid in certain states, including California, Idaho, Louisiana, Minnesota, Nevada, New Jersey, North Dakota, and Tennessee. I found some interesting stuff in here, but I've never been an education major, and most of the standards-based stuff is distracting or confusing to me. I think this would be a fantastic site for teachers. I think it could be a great site for homeschool moms with a teaching background. And I think it could be a great site for people teaching in a co-op setting. Seeing as I don't fit any of those, and seeing as I don't tend towards a lot of worksheets... well, I don't feel qualified to say much at all about this site and its merits. There is, however, a homeschooler section, run by Kristin Kindoll, that does seem to offer a more easily understood (by non eduction major me) way of accessing the site. She posts articles and links to her favorite lesson plans. I found by going through this homeschooling section I was able to find materials I could adapt to my school. Hans Christian Andersen Fairy Tales -- this lesson plan includes a fair amount of background information, and has you go through five Andersen stories with discussion questions and activity suggestions. This is a lesson plan that I do find helpful, and we are using it. Fairy Tale Journey -- this lesson plan is bare-bones, and has the kids listen to a fairy tale and then write one starring themselves. I don't find this one to be even remotely useful to me. Denmark, the Landscapes -- this lesson is very classroom oriented, and filled with all kinds of things like writing imaginary travel journals. While I love the idea of studying Denmark in conjunction with a study of Anderson, this particular plan is not something that I find useful. The Ugly Duckling, a Discussion of Human Rights -- this is a straightforward lesson plan that mostly involves reading the story and discussing it. I could see where something like this might have helped me when I was just starting out, but at this point, I can hold discussions about literature with my kids without the aid of discussion questions like "Have other children ever laughed at you?" being suggested to me. From the things I looked at in the homeschool section of Lesson Planet, I think the above is representative. There would be good background information in Kristin's article, and probably about one in four of the suggested lesson plans would be one I thought I could use with some tweaking. And maybe another one in four would give me an idea that I could use to create my own lesson. One problem though is that I counted a total of 31 articles in the homeschooling section, and not all of those are exactly lesson plans. So you are kind of limited at this point in how useful this section can be. One thing I noticed in working through the article archives, though, is that I could create a civics plan from what is presented here -- there are four articles on democracy. And there is an article on CSI Lesson Plans that is intriguing. There's an article on Treasure Island, and one on Mark Twain. Weather is covered, as are Earthquakes, and Magnetism. So a lot of the articles do appeal to me. But still, this is not a service I'd pay for at this point in life. It is not a good fit for me. But it might be for you. They do offer a free 10 day trial, so if what I wrote intrigues you, please go check it out. Membership is $39.95 per year. Disclaimer: As part of the TOS Homeschool Review Crew, I did receive member access to the Lesson Planet website for free. The fact that I received complimentary products does not guarantee a favorable review. It does guarantee a review. A fair review. But I am not going to praise something unless I think it deserves the praise. If I don't like it, you'll hear that. And hopefully with enough detail as to why so you can decide for yourself if what I hate about it makes it perfect for your family. For more about my take on reviews, visit my blog post here. That quote pretty much sums up my attitude about school in the summer. It's hot. I'd rather stay inside, near the window air conditioner, and get a bunch of school done. Then, we can take time off in May, when it is lovely outside. Or in September when the tourists have left. And we can take time off to do all the holiday activities that occur in November and December. Or take off three days when the grandparents visit in April. Officially, our school year runs from January to October. That may need to change as we start doing more traditional school year activities. We'll see. And what it looks like: In September, we "start" a new grade. Oftentimes that does mean something new for history. It does mean the new Latin class starts up. Starting this fall, it will mean a new science class. And we do end up with quite a few days off here and there when the weather is simply too beautiful to be cooped up indoors. In November, our official break occurs. In reality, that doesn't usually look a lot like a break. The online classes continue, and we continue doing at least 2-3 days per week of subjects like math and reading. And we tend to do "Christmas School" by changing up our read-alouds. In January, our school year officially begins, and we usually have some things that are changing at that point. We will take a couple days off here and there, either to play in the snow, or to enjoy those 60 degree days that seem to occur at least once during January. We tend to stay with a pretty official-looking school schedule though (with short breaks in there too) up through around now, the last week of April. Right about now things start to get a bit crazy with Boy Scouts, and we end up incorporating a lot of scouting activities into our schoolday, or taking days off entirely to get kids to camp. And May... well, we end up with more than a couple "it's too beautiful outside to do school" days in May. June is broken up with summer camps, summer reading programs, summer volunteer opportunities, and the like. Our online classes are usually done, and we usually change things up a bit for school -- throwing in something fun and different. June tends to have a lot of days off. But in July, that's when I feel like Ms. Austen. It's hot and yucky, much of our summer plans (camps in particular) are past, and we can get back to a much more real school schedule again. We try to get some outside time in the morning, when it is still relatively nice outside, and then do schoolwork in the afternoon. Pretty soon we are back to September, and considering ourselves a new "grade" and starting in pretty seriously again. Sometimes it feels like we never get a real break, though. But there are lots of short breaks throughout the year. Last week we only schooled two days. This week, it will probably be three. I don't want the three months off thing, where you end up having to start over in the fall because you have forgotten everything. But this year? Well, I'm toying with the idea of taking at least two weeks off of (almost) everything (we have a couple online classes that we really can't control) while we are just at home. I think we all need it. The TOS Crew Blog is sponsoring a question of the week every Tuesday. Watch for what my Crew Mates have to say about obedience tomorrow! So, yesterday Dale & I "celebrated" our seventeenth anniversary. Celebrated implies we did something unusual, and that was not the case... it was a day of chasing to swim lessons, grocery shopping, well... I suppose root beer floats with the kids is how we celebrated. "I'm planning a marriage, not a wedding." There are a few things I'd love to be able to go back and tell that bride. One is that she was on the right track to not be terribly concerned about whether or not the ring arrived in time or the flower girl's basket coordinated with the woodwork in the church. I don't truly think there was a single thing in all that wedding planning that truly mattered longer than a few weeks down the road. The big thing I'd like that bride and that groom though? That they truly are marrying more than each other. They are marrying each other's families. And that spouse is going to relate to you based on what they saw growing up. I know I am far more like my mom than Dale ever expected (if only that carried over into keeping a clean house!) and I had definite expectations that Dale would be a lot like my dad. And Dale carried a lot of baggage from his parents' broken marriage that still impacts us today (well, this past week anyway). I'd also encourage that bride to remember to show respect. Our culture devalues men. My husband grew up with male-bashing being the norm. I think the single most important thing that I didn't know seventeen years ago was the difference it makes for a man to have a supportive wife who believes in him, and demonstrates that fact. What I wouldn't tell that bride is that she'd spend her 17th anniversary cruising Lowe's and Home Depot, and enjoying root beer floats with her groom and their five children... and I certainly wouldn't tell her that she'd be homeschooling them. I'm pretty sure she would have fainted dead away. My kids love audiobooks. I love audiobooks. So I was thrilled to get the opportunity to review a couple of CDs put out by a little company in Iowa -- Plain Tales. 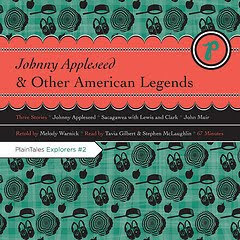 The CD Johnny Appleseed and Other American Legends, is what we dug into first. Thomas was going to be doing Tall Tales for Cub Scouts, so we listened to the Johnny Appleseed portion of this CD before his meeting. We loved it. The other two stories on this CD include Sacagawea and John Muir. Like most children's biographies, there were certainly some elements put into the stories that we have no way of knowing if they are true or not. But those aspects were plausible. My kids enjoyed the stories, and they are something I'd be happy to let them listen to again. The entire CD is 67 minutes, so each story is a nice length... long enough to convey a lot of information, but not so long that my kids lost interest. My boys (ages 6 through nearly 13) all enjoyed this, but the 4 year old was not terribly interested. I think if we had listened in the car, she would have been fine. 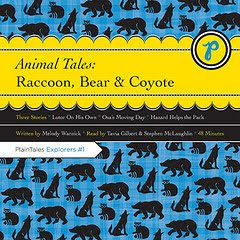 The second CD -- The Tales of Raccoon, Bear and Coyote -- is clearly fictional, but the stories do convey a good sense of what these animals are like. My younger three (4, 6 and 9) particularly liked this volume. The older two thought it was okay. This CD is a bit shorter (48 minutes) which was a very nice length for the younger kids. At $12.95 each, these seem to be a good value. They have other titles, too, including Tall Tales, Fairy Tales and Dragon stories, and albums featuring the stories of Beatrix Potter, of Rudyard Kipling, and those of Hans Christian Andersen. I have already put more of these on my wishlist at Amazon. Great stuff! Disclaimer: I did receive these two CDs for free from the publisher in exchange for my honest review. The fact that I received a complimentary product does not guarantee a favorable review. It does guarantee a review. A fair review. But I am not going to praise something unless I think it deserves the praise. If I don't like it, you'll hear that. And hopefully with enough detail as to why so you can decide for yourself if what I hate about it makes it perfect for your family. For more about my take on reviews, visit my blog post here. I reviewed the "speech" part of Super Star Speech the other day. Today, I'm talking about their other product line -- Super Star Games. For only $3.50 each (less if you get a bundle), there are nearly a dozen educational games that you can download, print and play. Debbie Lott, a homeschool mom, has put together games covering a variety of topics, from history (explorers, American revolution, Ancient Egypt), science (plants, animals, insects, inventors, astronomy), English (parts of speech), or geography (continents, colonies). 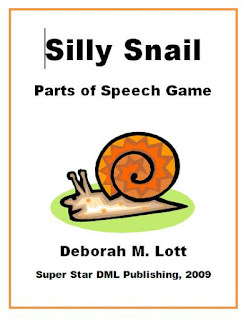 I already owned the Silly Snail game, the one that covers parts of speech. We didn't replay it for this review, but some time ago, we had found it to be a fun change of pace for reviewing nouns, pronouns, verbs, and all that. 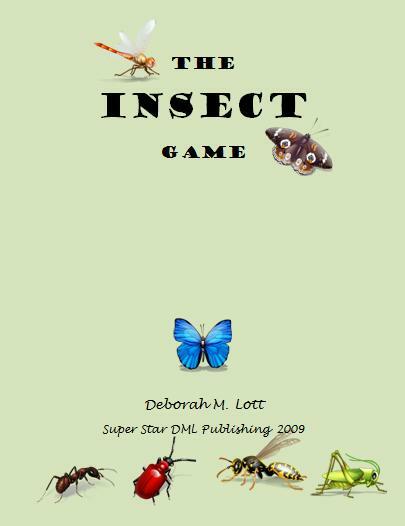 For this review, we printed out the Insect Game, and Covering the Continents. We chose to print in black and white, which worked well. With both games, I was impressed with the variety of questions. And especially with the Continents game, it was very, very nice that there was enough "chance" involved that the person with the most geographical knowledge (Connor, in our case) didn't necessarily win. I don't believe he answered any questions incorrectly (the game is intended for ages 6-10, and he is nearly 13), but in the end, he had only settled one continent. My kids don't think any of these games are going to beat out Risk or Battleship for "most favorite" anytime soon. BUT, they did propose that we play a different one every Friday as a reward for getting their schoolwork done. Some caveats: it is assumed that the kids are reading quite well, at least in the games we have tried so far. So we adjusted the rules to make me a "master reader" to avoid the inevitable issues with early readers messing up the questions. Probably not a problem for most of you, but it is an issue for me. 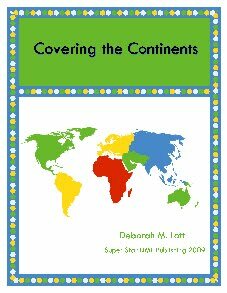 And had we printed the "question" cards for the continents in color, it would have been way too easy for my kids to cheat (inadvertently, or on purpose) as each continent has its own color. But these are a winner. I will watch for additional games to come out, and will probably make some more purchases. Disclaimer: As part of the TOS Homeschool Review Crew, I did receive ebooks for free from the publisher. The fact that I received complimentary products does not guarantee a favorable review. It does guarantee a review. A fair review. But I am not going to praise something unless I think it deserves the praise. If I don't like it, you'll hear that. And hopefully with enough detail as to why so you can decide for yourself if what I hate about it makes it perfect for your family. For more about my take on reviews, visit my blog post here. A couple friends have posted this, and I had to join in. Thanks Michelle and Kristen! When I first saw Super Star Speech as a vendor for the TOS Homeschool Crew, I was not all that excited. I did not think I needed it. I wished it had been available when my oldest was younger though. But a funny thing happened. We started having a lot of difficulty in understanding Katrina's speech. We were constantly having to ask her to repeat herself, and often relying on her big brothers to figure out for us just what she was saying. Dale, out of the blue, said, "Do we need to get her into speech therapy?" Basically, Debbie Lott, a licensed speech language pathologist, has written the above manuals to help parents to work with their children on articulation issues. The books lay out a straight-forward, easy for parents to understand method to evaluate what sounds your child needs to work with, and then gives suggestions for working on those sounds. We dug in, I read through the intro materials, and we (Dale & I) sat Trina down to do the initial assessment. And we were shocked to discover that Trina did incredibly well on the assessment. The sounds are tested pretty much in the order that children generally master them, and the first sound Trina missed was the /l/ sound... which she should master as a 5 year old. We went ahead and tested other kids too... Richard (almost 6 at the time) was perfect, and Thomas (age 9... with some hearing issues, which is why I wanted to test him, just to be sure I wasn't missing anything with him) nailed everything too. She tends to use sophisticated vocabulary, so those normal articulation issues are magnified. What I did was to read through the materials that I now own for the /l/ sound, and I am very, very informally working with Trina on that sound. Only because she gets frustrated when people don't understand her. And the R & L book is going to be great for that... the beauty of the specialized books is that they have more games and are just more fun. What do I think? Well, I feel guilty for asking for all four books when it turns out we didn't need the advanced ones anyway. But I am thrilled to be able to relax about whether or not Trina needs help. And my advice? 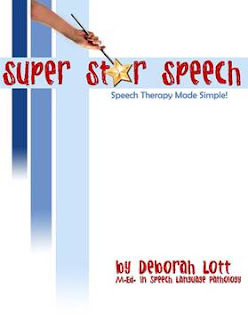 If you have a child who you think maybe needs some speech help, I would highly recommend getting the first Super Star Speech book. The e-book is only $12.95, and even though it turns out that we didn't "need" it, I would say that purchasing it would have been worth every single penny. After doing the assessment, you can purchase specific letter books, also $12.95 for the ebooks. Or if you know for sure that you need more, there is a bundle available that saves you money. We did have a couple of issues with this, though. 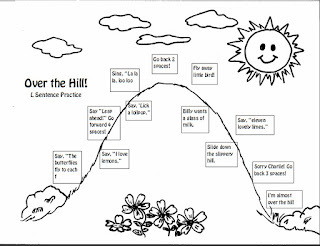 In the assessment, you have a page of pictures, and the child is supposed to say the picture without hearing it from you first. Some of the pictures were a bit difficult, especially for a younger child. We had to give hints to Trina to get her to say "peanut," "potato," and "orange" in particular. Other than having color in the pictures, I'm not sure how to improve them. But I wanted to mention it. Tomorrow, I'll be blogging about the other side of the Super Star Speech product line -- their games. I'll try to remember to come back in and link it. Disclaimer: As part of the TOS Homeschool Review Crew, I did receive ebooks for free from the publisher. The fact that I received a complimentary product does not guarantee a favorable review. It does guarantee a review. A fair review. But I am not going to praise something unless I think it deserves the praise. If I don't like it, you'll hear that. And hopefully with enough detail as to why so you can decide for yourself if what I hate about it makes it perfect for your family. For more about my take on reviews, visit my blog post here. "But my kids don't listen to me..."
Romans and Greeks and Myths, oh my! Any Colorado Bloggers want to join this Blog hop?